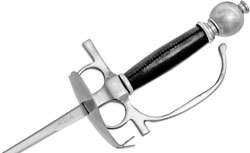 Stage Combat Court Swords for sale are 40 ¾ inches in all and weigh 11 ounces. These sabers are inspired by real court swords that were popular during the Renaissance period. They are durable enough for stage combat, sport fencing and HEMA and feature a 34 ¼ inch stainless steel unsharpened blade. The 5 ½ inch handle features a black rubber grip. The point of balance is at 4 ½ inches. Buy the popular Stage Combat Court Swords for $159.99.